A luxury fitted 3 bedroom detached villa with private SOUTH FACING swimming pool, situated in a prime position within a traditional Cypriot coastal village. 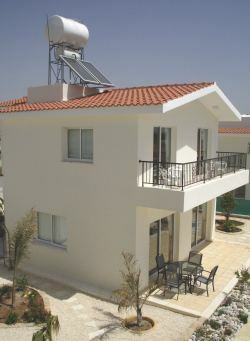 Providing lovely sea views from the rear and views of the Troodos foothills and mountains from the front. This modern built villa has well appointed accommodation throughout with the ground floor comprising of a large open plan living room and dining room, a well equipped kitchen, and downstairs cloakroom. Two sets of large patio doors lead from the living room/dining room out onto the veranda, swimming pool and garden. Satellite TV with childrens channels. 4 sunbeds, 8 garden chairs and 2 tables. DVDs, books and board games. First floor consists of 3 large double bedrooms, the master bedroom with an en suite shower and toilet. A further family bathroom is also upstairs. Both rear bedrooms have patio doors leading onto a first floor balcony which overlooks the sea. The living room is part of an open plan living space of 7m x 10.1m. It is equipped with a T.V. cabinet, television, DVD, 3 piece suite, vase, framed pictures and two coffee tables. There are 'throws' for the 3 piece suite. The 3 piece suite sofa converts to a double bed. There are music CDs, books, Playstation 1, and a selection of games in the living room. The dining room is part of an open plan living space of 7m x 10.1m. It is equipped with a dining room table and 6 chairs. There are framed pictures on the wall, glass fruit bowl, and place mats on the table. A high chair and travel cot can be provided if required. The kitchen measures 3.3m x 3.1m and is equipped with an electric cooker and hob; washing machine, microwave, fridge freezer, kettle, two toasters, toasted sandwich maker, baking tray, bottle opener, set of kitchen knives, casserole dishes, cheese grater, chopping board, coffee perculator, corkscrew, dinner service (for 8 persons), cutlery set (for 8 persons), fruit bowl, frying pan, saucepans, 8 tumbler glasses, 8 wine glasses, kettle, measuring jug, 8 mugs, potato peeler, salt and pepper pots, oil and vinegar pots, sieve, set of kitchen utensils, 3 storage containers, swing bin, 8 table mats, teapot, 6 tea towels, tin opener, sugar/coffee/tea jars, 1 tray, and ice lolly makers. The kitchen also has a breakfast bar with three stools. The downstairs cloakroom consists of a toilet and handbasin. The master bedroom is air conditioned, and has a ceiling fan, it measures 3.3m x 3.6m and has a tiled floor. The master bedroom is equipped with large built in wardrobes, double bed (5'), 2 bedside cabinets, 2 bedside lamps, radio alarm clock, tall standing dress mirror, hair dryer and framed pictures. Bed linen and towels are provided. The master bedroom en suite has a tiled floor and consists of toilet, shower, wash basin, mirror, floor mat, shower curtain, and toilet brush. Both the master bedroom and rear double bedroom have large patio doors leading to a balcony with sea views. There are two outside tables and 4 chairs, so that guests may enjoy a cool glass of wine whilst watching the sunset over the Mediterranean sea. The rear double bedroom is air conditioned and has a ceiling fan, it measures 3.6m x 3.7m and has a tiled floor. The rear bedroom is equipped with large built in wardrobes, 2 single (3') beds, bedside cabinet, bedside lamp, radio alarm clock and framed picture. Bed linen & towels are provided. There are also within the bedroom cupboards an ironing board, iron, and clothes horse. The front double bedroom is air conditioned and has a ceiling fan, it measures 3.3m x 3.6m and has a tiled floor. The front bedroom is equipped with large built in wardrobes, 2 single (3') beds, bedside cabinet, bedside lamp, radio alarm clock and framed picture. Bed linen & towels are provided. A cot can be provided if required. The family bathroom has a tiled floor and consists of a bath with shower, toilet, washbasin, mirror, floor mat, toilet brush and shower curtain. The garden is large and has been professionally landscaped. With this being a detached villa, the garden extends completely around the villa. The garden is well stocked with fruit trees, palm trees, native shrubs, bushes and herbs. 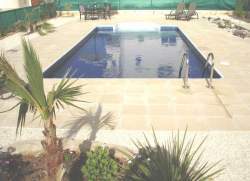 Within the garden there is an 8m x 4m swimming pool with two patio tables, 8 chairs and 4 sunbeds around the outside of the pool. 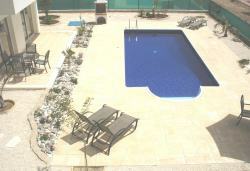 Also on the pool sun terrace, there is a Greek stone BBQ. To one side of the villa there is a private drive for guest parking. Within the shed there are, 3 snorkels and masks, 3 sets of flippers, a selection of pool toys, and 5 sets of beach/sea shoes to use in the sea. Guests are welcome to use any of these, but please leave them behind after your visit. Mandria is a quiet village located 10km from the hustle and bustle of Paphos, 5km from Paphos airport, 3km from Secret Valley and Aphrodite Hills Championship golf courses; And a short walk from secluded sandy beach coves. The village could not be better located to the airport. It is a short 10 minute drive from Paphos airport to Mandria village. The route is straightforward requiring only three changes of direction. Within the village there is a bank, small supermarket, a gift shop, coffee shop, bakery & home made icecream shop. Within the village square there are two tavernas. Yiannis Taverna is a traditional taverna where you can sit outside under a vine with grapes hanging. George's taverna on the other side of the square is slightly better equipped for eating inside. On a friday night during summer months there is live Cypriot entertainment at George's. Both Tavernas are exceptional value, meals and drinks for the evening are unlikely to cost more than �5 per head. Mandria is ideal for nature lovers, with gentle views over rolling fields, and fruit groves to the sea. The area is well known for its flora, and bird watching. As well as the traditional fruit groves, the area has a number of peanut plantations. Each October the village celebrates the peanut harvest with a Festival of song, dance and wine. Mandria being a village does not suffer from hordes of tourists. Consequently the secluded beach coves at Mandria are often empty or very quiet. The beaches are a short 10 minute walk through the fruit groves and peanut fields over flat ground. It is also possible to go fishing from the beaches. A 5 minute drive from Mandria is Petra Tou Romiou, the birth place of Aphrodite. Within a 4 minute drive are two Championship golf courses, Secret Valley and Aphrodite Hills.